As a leader, one of your roles is to inspire and engage your teams to do their best. Individuals who trust you will exhibit higher levels of productivity and performance. Building a trusting relationship with employees can take a long time—and quickly disappear if a situation is not handled well. In a recent study, leadership expert John Hamm says nine out of 10 managers are in “negative trust territory” before they even make their first request of employees. Good and consistent communications are imperative. Over the next few weeks, we’ll tackle foundational ingredients needed to further build trust in your organization and how they fit into your communications strategy. 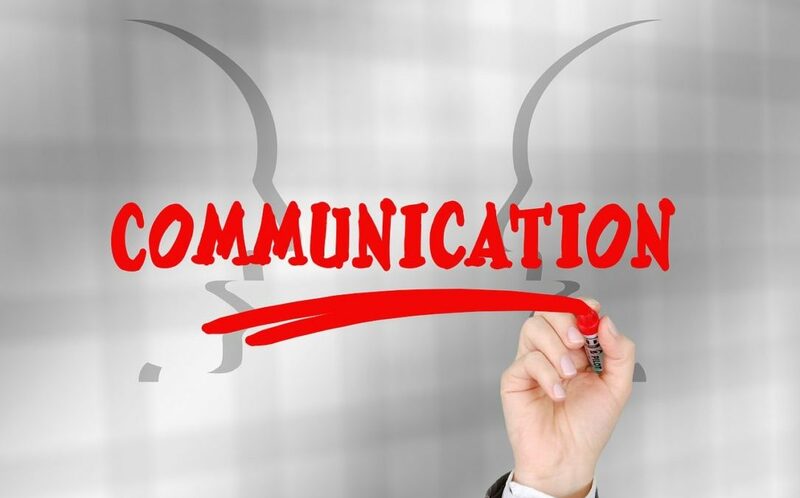 First up in our three-part series on Employee Engagement is two-way communications. In the past, employees accessed and processed information from only top-down communications. In today’s technology-driven world, however, people are less satisfied with being passive recipients of information. They now rely on a variety of different company resources to access and learn new information. But despite all this secondary information, people will process information and decide how they’ll act based on conversations with others. That’s where two-way communications, or dialogue, comes in. Effective two-way communications or dialogue is key to building trust over time. One-way communication, such as cascading information “through the ranks” without any feedback loop, is not very effective in building trust. Why? Many reasons, including that most organizations cascade information through basic emails. As we can all agree, email communications don’t often allow the sender to effectively add relevance to the message. Therefore, email often doesn’t encourage much interaction and feedback. Because of this, we recommend you minimize one-way communications like emails. Understanding and belief around a concept or strategy. Engagement and commitment to an agreed-upon outcome or objective. Better results by sharing best practices and collaborating more effectively. The ability to process information received in the past. If you’re talking with an individual employee or a group of employees, ask open-ended questions. In doing so, you’re telling them that you really want to hear their thoughts, versus asking a question that leads them to a specific answer. Also, it’s valuable to repeat any question that’s asked, especially if you’re in a large-group setting. Doing so serves two purposes. First, it tells the questioner that you heard him or her. And if you misheard, it gives the person a chance to re-state the question. Second, it allows everyone to hear the question. This should be done whether you’re discussing a topic in person, or through technology. If you’re provided with feedback or asked a question you don’t have an answer to, say so. Don’t bluff or guess. Simply say you don’t know and tell them you’ll get them the answer. Be sure to let them know when to expect the answer, too. And, of course, when you provide feedback, be clear and honest. Use positive, respectful language versus being defensive or otherwise reacting negatively. A respectful response is always more productive! Also, how many times have you been asked for feedback and then the meeting “ran out of time” and you didn’t get a chance to express your views? If you’re a leader asking for feedback, make sure you give everyone who wants to contribute a chance to do so. Or, if does run short, be clear how employees can share additional feedback with you. Similarly, if you’re in a large group setting and one or two people are monopolizing the conversation, intervene. If you don’t, they’ll steal valuable time from others or, worse, send a message that you’re playing favorites. Another powerful way you can leverage feedback is to take input from one person in a meeting and pose it to the wider group. For example, after re-stating a piece of feedback, you can ask questions to elicit more feedback from the group. This is powerful because it tells others you’re really listening and that you’re willing and able to be vulnerable. Great leaders recognize the importance of bringing vulnerability to work because it’s the foundation for open, two-way communications. To add some “punch” to this point: Authenticity is a high value among Millennials, and, behaviorally, being vulnerable in the workplace is one piece of this. By 2020, nearly one in three adult Americans will make up this generation. By 2025, they’ll make up 75 percent of the workforce. So, authenticity is increasingly relevant to leaders and organizations today. Does anyone else see it differently? What am I/we missing here? Avoiding distractions and paying attention during dialogue (the “be here now” concept). The main culprit here is technology. So close that laptop and silence your phone. Also, ask anyone in attendance to do the same. Using your body language to show that you’re listening. We’ll have more to say about this next. Periodically re-stating and reflecting on an individual’s key points to show you understand what he or she said. Deferring judgment by letting the speaker finish. Not interrupting someone is probably one of the most difficult things to do. Many of us have the habit of formulating our response to a question or comment before the person talking is even finished talking. Bite your tongue! Many factors impact trust levels in an organization, including the level of authentic, open dialogue. But nothing tears it down faster than not acting on feedback received. So, take in what you hear, but be equally vigilant about acting on the information. And in situations where you can’t act on the information or feedback, for whatever the reason, be willing and vulnerable enough to say why. Open dialogue is a cornerstone to building strong employee engagement. As part of your strategic communications program, be sure to integrate consistent feedback loops. Welcome the information, whatever it is, and then act on it. If you’d like a partner to help you develop ways to help improve two-way communications within your organization, we’d love to hear from you. In the meantime, check out our second article in our Employee Engagement series: employee acknowledgement and recognition. And when you’re done with that, be sure to check out the third article in our series: authenticity in communications.